She got out of the car and walked up the steps. Today’s event was at Shannon Donovan’s house. The mother of the groom had wanted a close-family-andfriends celebration before the official engagement party tonight. Gracie blew out a deep breath. Another day with the Donovan clan, and a new opportunity to change her ways with the professor. 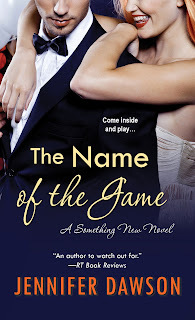 The Name of the Game by Jennifer Dawson is a contemporary romance, released by Zebra Books on September 29, 2015.